méli~mélo art: I have been busy...having fun! 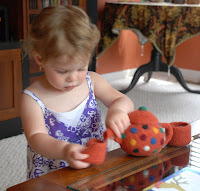 Here is the knitted, felted teapot I made for little Ava. I used this pattern from the Pattern Box. You can download it for a small fee. It is worth it. 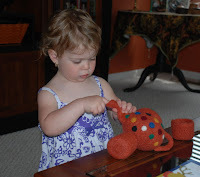 The pattern has clear instructions and is easy to make in an evening, at least the knitting part. Isn't it adorable? Ava loves it, yeah! Now, if I can just get her to use the handle for pouring. 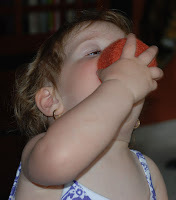 It seems it was good to the last drop! 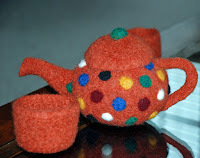 I cannot decide whether to needle felt the teacups with polka dots as well. What do you think? I kept it simple and knitted my own version of teacups...no handles or saucers. However, the download pattern includes the matching teacups. 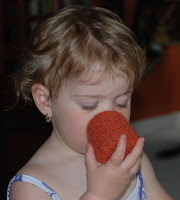 The wool I used was Paton's Wool, I have used this colorway before and it always felts perfectly. The pumpkin shade is so cheerful. If you decide to make one, I would love to see your version...enjoy! Thank you, Tina. Yes, Ava is adorable, we have such fun together!